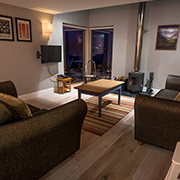 …a stunning home from home, located on the beautiful island of Muckle Roe in the Shetland Islands – the perfect getaway. Originally a place of worship built for the local community in 1911, the Chapel was renovated and extended to a very high standard in 2014, creating the ideal rural retreat with a stunning seaside view. The Chapel won the 2016 Saltire Society Design Award in the Renovations and Extensions category. The Chapel has a spacious open plan living area with large windows exploiting the wonderful views and a wood burning stove for added comfort. 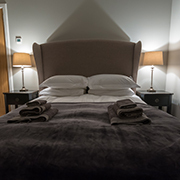 The three bedrooms are well furnished, providing spacious holiday accommodation for up to seven people. The enclosed garden with wooden decking is a fantastic spot for watching the rich wildlife – seals, orcas, porpoises, birds and, if you’re lucky, an otter. 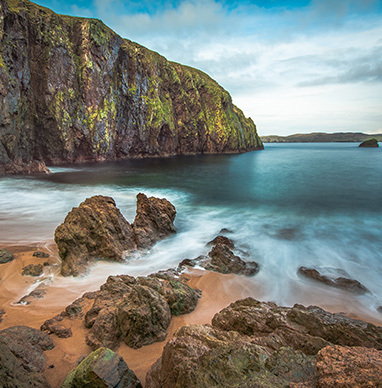 Muckle Roe is an ideal base for exploring Shetland, offering the tranquility of a rural location with incredible views and stunning walks, while being close to amenities and good road and ferry links for exploring the rest of the islands. We look forward to welcoming you to the Muckle Roe Chapel!